I have a 2007 Fusion SEL 3.0L V6 and about to replace some hoses. I have two hose PNs, KH-337 and KH-884, that I need the constant tension hose clamps for (like the ones that came on the car). Stopped at local dealer with the hoses and all they could offer were the worm-gear type which surprised me. Not a good clamp to use especially in a hard to get to location (won't be having them do any of this work for sure). Called Ford corporate twice (they are in India? Who knew!) but just get websites and phone numbers for parts finders (that can't find them) and the 800# for Ford parts that doesn't have any awareness of these parts. Does anyone have any idea how I can find the Ford PNs for the OEM clamps for these two hoses? Separately, does anyone know who manufactures them for Ford? I'm trying to avoid using "universal" constant tension hose clamps like they sell at Autozone or Advance Auto Parts. P.S. I've searched the forum extensively. Spring clamps that uses the spring cable pliers? Rock Auto carries just about every type imaginable. They look more like the ones in the attachment; flat, not the wire type. RockAuto only has the worm gear type as far as I can tell (the Tools & Universal Parts tab). Perhaps I am just not finding them? Because I don't have part numbers I can't search for them that way. 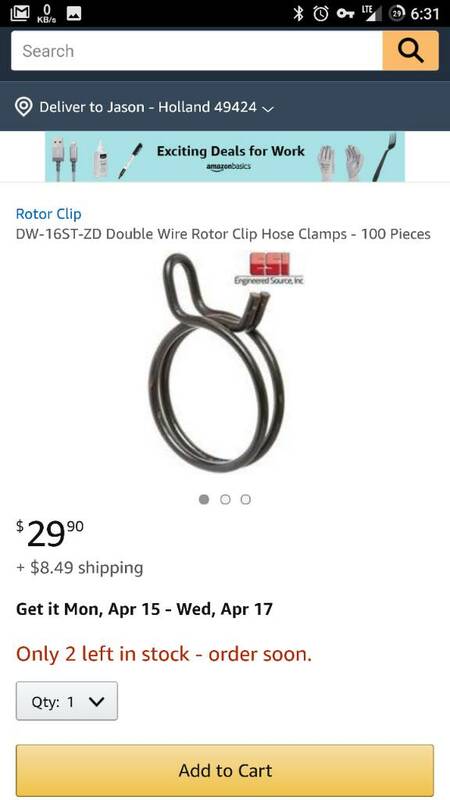 Searching under "hose clamps" for my vehicle only turns up the hoses. Got quiet all of a sudden. I sent the following letter to Ford in Dearborn (personal info redacted LOL). Be interesting to see what response I get. I have a 2007 Ford Fusion SEL 3.0 V6, VIN ***, purchased new from *** Ford in ***, my local dealer. In general, I am looking for the part numbers for the constant tension hose clamps used on this vehicle and where I can purchase them. In particular, Motorcraft hoses KH-337 and KH-884. The parts department at my dealer was of no help. The counterman told me they only use the worm gear type clamps which really surprised me from a quality perspective. I am not going to compromise my vehicle by using aftermarket or inferior solutions. I am reticent to reuse any of the clamps that originally came on the car, primarily because it takes a great deal of engine compartment disassembly to get to some of them (and $50-$60 of replacement coolant) if a reused clamp fails. I called 1-800-392-3673 twice, but all they could do was refer me to a few parts finders (greensalescompany.com, vpartsinc.com, and partsvoice.com), all of which require knowledge of part numbers I don’t have. None have a method to browse their catalogs as far as I can tell. Another reference was to 1-800-543-4959, but the gentleman who answered, while friendly enough, did not have knowledge of such clamps, saying he was only familiar with the worm gear type. I’ve searched the web at length, including Ford.com, to no avail. It should not be this difficult to find the correct parts for my car. Any assistance will be greatly appreciated. I can be reached by phone at *** and email at ***. Honestly. I prefer the old heavy screw type. Unless you had a valuable , classic , concours car ( which you dont ) where you would get a deduction of points for not having original type clips , I cant understand your obsession with these clips . As for "worm-gear type not a good clamp " , utter nonsense . They are used on Rolls Royce , Ferraris and a host of other top end cars not to mention ordinary production cars .I personally have used this type of clip on many different quality and performance cars over many years with no problems as did my friends in the Police garage who repair virtually every make of car on the road . If you had worked on various cars you may have came across and cursed at these clamps where it was very , very hard to get at with pliers and even with specialised flexible long reach hose clamp pliers which many mechanics / DIYers dont have . A lot easier with a few extensions , a flexible joint and a socket on the end of clip . If you buy genuine , quality screw clips and correctly tighten you wont have any problems .